We had an outstanding experience and we so glad we chose SoundFire DJ! SoundFire DJ made our wedding reception such a fun and relaxing time. Alton made sure that everything went smoothly whether it was the flow of the music, helping get everyone through the buffet line, personalizing the entire evening, and so much more. We wouldn’t have changed a thing and so many guests kept saying what a great time they had. Thank you SoundFire DJ for making our special night so much fun!! Alton with SoundFire DJ was absolutely amazing, All of our friends were on the dance floor the whole time! He also did an amazing job with personalizing our wedding! I'm still getting comments about how awesome the DJ was! Alton was really easy to work with and talk to. His experience with music, weddings, & being a DJ really shows. Alton made sure to check in throughout the wedding planning & his monthly planning check lists were awesome. It is about 4 months after our wedding, and we are still getting compliments on how awesome our DJ was. As my husband and I reminisce our day, we will always have the memory of an amazing DJ on our wedding day. We wanted our reception to be a big party, and it was with SoundFire DJ. 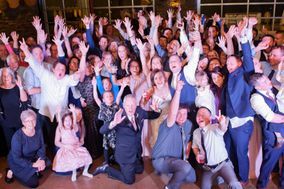 We chose Soundfire DJ because we had a feeling that they'd be able to help us make our wedding an amazingly fun party for us and our guests, and they did that and much more! The dinner music was exactly what we were hoping for and set the mood of our European theme. And the reception was the epic Italian dance party we wanted! We truly appreciate all the guidance they provided throughout the planning process, the level of detail they put into personalizing the reception, and the flexibility and willingness to help with potential issues or changes came up. We couldn't have asked for a better night! The SoundFire DJ team was so much fun! I do not know where to begin when talking about the service Alton provided for us. When booking with a DJ you expect them to ask - what music? - - - but With Alton, we got, "what is your love story? how are you connected with your bridal party, and your parents?" These are the things and the people that made our night the celebration of a marriage. We were so appreciative of the personal stories shared at our reception. The great music and sound system was just the cherry on top. He kept our wedding ceremony and reception flowing the entire day - without a hiccup. One of the most memorable moments was at midnight, dancing to Avicii with all of our friends and family surrounding us, rocking with us. We thank Alton and the crew at Soundfire DJ for their unbeatable service. They are truly experts at this profession and treat their clients to an incredibly memorable experience. Alton is AMAZING and way more than “just a DJ”. He handled our entire wedding - outdoor ceremony, cocktail hour and indoor reception. He is so professional and accommodating. His equipment is top of the line, and his personality is perfect. He took the time to get to know us for who we are, and it showed through the entire day. He recreated our love story based of stories my husband and I told him separately, and made every moment count. 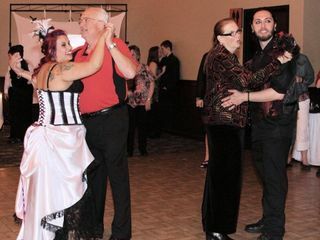 Alton kept the dance floor full while incorporating all the “traditional” dances and rituals. He also helped keep our day special by having us tell him things individually that he brought up during the reception. If you are getting married, planning a party or need an amazing master of ceremonies, I could not recommend Alton enough. Worth every last penny we spent and then some. So Much More Than "Just A DJ," Alton Is an MC!!! From the moment we met with Alton, we knew we couldn’t go with anyone else. He took the time to get to know us personally and made our day run amazingly. The things he did with having him tell our love story for everyone to share in our special journey was incredible. He provided music and sound for our ceremony and through the rest of the night. Everything was planned perfectly and incredibly unique. Everyone had a great time and the dance floor was packed all night. Alton was able to do so many unique things with having us record messages to each other (we had no idea what each other had said) and then incorporating them into our first dance. It was very emotional and very unique. Alton worked with all of our vendors to make things run incredibly smoothly. We were able to plan our entire day with Alton, which made our stress levels go down, and left us with practically nothing to worry about. It was a truly special experience, and couldn’t recommend Alton and SoundFire DJ highly enough. When I reached out to Soundfire DJ. Alton almost immediately responded via Facebook, and suggested we meet for coffee. We liked him right away and could tell he was a professional. He was open with price and package options and made us feel like we were truly planning our one of a kind special night. SoundFire DJ sent me monthly checklist emails, with things to work on each month. We met with Alton at our reception site a month before the wedding, to meet with the wedding coordinator there and go over our banquet hall space. We met with Alton for the last time a little over a week for a final walkthrough of the reception and everyone’s expectations. He answered all of our questions. Upon leaving I felt very assured that the wedding day would go amazingly. Alton also did our ceremony sound system, to mic our harpist, the groom, and the officiant. He showed up on time to do the mic check, and did an awesome job for the ceremony, the sound had no issues at all. When we arrived for the grand march later that night, he met with all of us to go over expectations for the march. Alton did an INCREDIBLE job the entire night! He kept the guests engaged and entertained throughout dinner and dancing There was only one minor flaw when the wrong song was initially played for a dance with my stepdad and I. Besides that, the grand march, the dances, the garter toss and cake cutting all went flawlessly. He was very responsive to our needs during the night, and really got along with our wedding party and other guests. He did a shoely wed game for us (provided the shoes haha) but it was Game of Thrones themed which we loved! He also had many unique ideas for our garter toss that I will never forget! The songs and music quality were perfect. I also rented a projections screen from him which constantly played a cool slideshow of pictures that my Maid of Honor created. 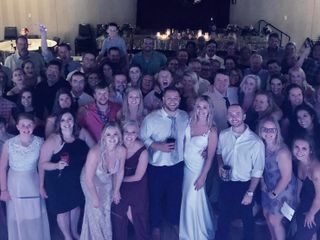 I 100% love my decision to hire SoundFire DJ, Alton and Heather made it a night we will never forget! Alton was absolutely amazing! 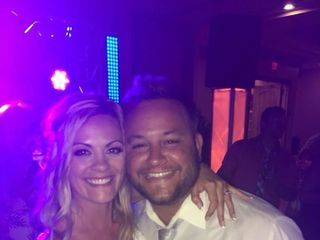 From the first email, the touch points before the wedding, to the wedding day, SoundFire DJ/Alton is dedicated to creating a perfect day for you. Alton takes the time to personally know each and every bride & groom. He wants to know how you met, how you fell in love, why you chose to be with each other. These little details were important to him because he is then able to enhance your wedding by sharing these personal details throughout the day! On the wedding day, Alton goes above and beyond to ensure the day is perfect! From managing the timeline to reading body language, he knows how to keep a crowd entertained and dancing all night long. Booking SoundFire DJ was one of the best decisions we made for our wedding! Working with the SoundFire DJ staff has been wonderful. They are very organized and attentive to every detail. 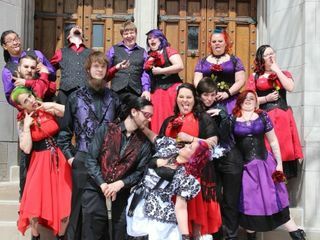 They customize your day to whatever you would like and have great ideas for the garter toss, bouquet toss etc. Their biggest concern is that you're happy and that your guests remember your wedding as the best one they have ever attended. Truly a delight to work with and will use their services again in the future. We had a great experience with SoundFire! Alton is professional, friendly, and flexible! He really listened to what we wanted! My wife Hannah Kidd and I got married on June 18th, 2016. We were looking for a DJ and found SoundFire DJ. My fiance, at the time, called and talked to Alton Olson. She said he sounded very professional and was very easy to talk to so we decided to meet with him. We met at the place of our reception and I could instantly tell he was going to be an amazing DJ. Just by looking at the room we had picked, he helped us by giving ideas on where we could put different tables and where everything would look the best. Through out the whole wedding process he was there for us, giving us timelines even for when things should be done that was above and beyond what a DJ was expected to do and was a tremendous help!!! The up lighting he did turned out amazing and was very beautiful!!!! 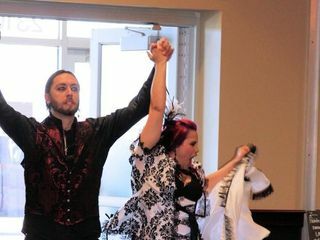 During our wedding he told us what we should all be doing(bride, groom, bridesmaids, and groomsmen) to have everything flow as smoothly as possible. He was always right on cue for every event we had that night. DJ Alton kept the dance floor going all night long, like I have never seen before from all the weddings I have been too. He also isn't afraid to get on the dance floor and show off some moves which was very impressive as well. 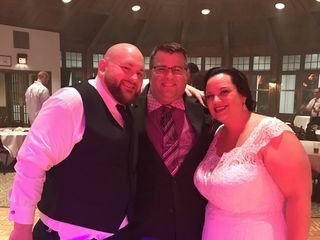 He was a big reason why our reception was so amazing and fun. Family and friends commented to us all night on how awesome he was. I truly believe my wife and I hired a DJ and left with a friend. Where do I begin to express the joy it was working with you both! It has truly been a pleasure, and I'm honored to now call you my friends at the culmination of this journey we went through together. I certainly had a great time with your family, and Hannah, your Dad, a fellow DJ, was great too. Most people don't understand what a DJ/MC's role truly is these days (some think we're human iPods or jukeboxes), so it's always nice to have a group that's in the know, and has fun on the musical journey of the night! Hmmm, what advice would I give on booking this vendor? Book them!! Alton was incredible to work with. Everything was taken care of in a timely fashion while we were planning, and he was always on top of things during the day of the wedding. He really helped keep everyone working together, and my photographer loved Alton for how he was willing to help make our pictures awesome with his lights! Alton also took the time to get to know us, and used that knowledge to really personalize our day and make it special. He introduced us and our first dance in a way I've never heard before at a wedding, and it was really touching. Now the best part - the music. If you're looking for a low-key reception where there won't be much dancing - this is not the DJ for you. Alton knows how to get a crowd moving!! 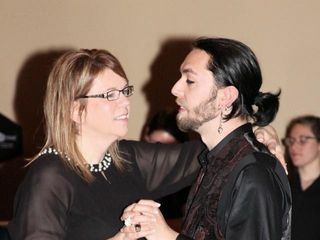 There was literally no awkward time from when the dance started where people were afraid to get out on the dance floor. He had the floor packed from the moment we were done dancing with our parents, and kept us dancing all night!! Also, if you want to have the coolest bouquet & garter throw, he knows how to come up with some awesome ideas to put a fresh spin on it. Our wedding day has so many beautiful memories thanks to Alton & SoundFire DJ. We wish we could go back and do it all over again!! When we were looking to hire a DJ, at first, we only thought about music. We also didn't hire the DJ as one of the very first vendors for our wedding because we thought all they did was play music. Meanwhile we're trying to figure out and stress over all of these details about our day, and we were totally lost! Then we found Alton with SoundFire DJ. After speaking with him we knew we had to hire him. Our stress level immediately went way down as he talked about how he could help with figuring out what we wanted to do for our wedding & reception. He was always very responsive when we had a question, we got these emails every month with planning checklists that were a huge help, and he kept in touch with us to make sure things were going smoothly. On the day of our wedding everything was perfect. The personal touches Alton shared about our relationship was really beautiful, and had my family laughing and tearing up (in a good way) all at the same time! I was getting so many compliments on our DJ, and we hadn't even started the dance!! Of course the dance was incredible. The dance floor was full all night, and the music was awesome. It's hard to describe it, but Alton knows music really well, and he's able to take familiar songs and do some really cool stuff with them. It's been a few months since our wedding, and I'm still getting compliments on SoundFire DJ. I highly recommend them for your wedding.